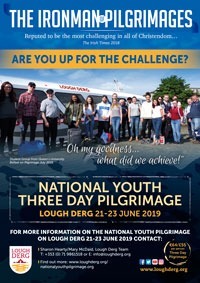 Bishop Donal McKeown, Bishop of Derry is leading this 3 day national youth pilgrimage to Lough Derg, Co. Donegal, Ireland from Friday, 21 to Sunday 23 June 2019. 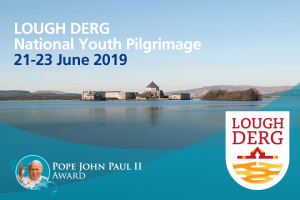 The Three Day Pilgrimage is a programme of prayer, fasting (one simple Lough Derg meal each day) walking bare-footed and 24hr Vigil. Without shoes and sleep and little food in our stomachs we are confronted with the essential aspects of life, everything else is stripped away and we can often discover our hidden strengths and rediscover what really matters in life. Described as the Ironman of pilgrimages, Lough Derg is a special place of peace and personal challenge. Click here for more details of the pilgrimage on the Pope John Paul II Award website. Click to download the pilgrimage poster. Please print and display in schools and parishes.